Baccarat is not a game that rivals blackjack or roulette in terms of popularity but it remains one of the top casino table games and here we explain the basics of how to play, along with some tips on strategy, information about the odds and a little information about the history of the game. Few casino games are as sophisticated and elegant as the game of baccarat which has won the hearts of high rollers and smart gamblers over with its low house edge and simple rules. Baccarat does not rival blackjack or roulette in terms of popularity but still remains one of the top casino table games. A favorite of the Crown’s top secret service agent, James Bond, this enticing game of chance is played all around the world, but enjoys a particularly high popularity among gamblers from Asia. It dominates the floors of Macau’s neon temples of chance where it is played for stakes high enough to make one’s jaw drop. This article will provide you with in-depth information on this elegant game’s history, its rules, and house edge. Players can also learn a few tips on increasing their chances of success at the baccarat tables before we finish off by introducing them to some of two more interesting variations of this centuries-old card game. Baccarat is easily one of the oldest casino games in the world, one that spans a history of more than 500 years. Historians would argue baccarat first appeared in 15th-century Italy where it was devised by a man called Felix Falguierein. It had its named derived from an obsolete word that meant “zero” in Italian, which makes sense considering all face cards in baccarat are assigned a value of zero. Some believe the game borrowed its rules from an old Etruscan legend which tells the story of a maiden whose fate was determined by a toss of a nine-sided die. If the toss resulted in a nine or an eight, the maiden was to be chosen as a priestess by the gods. The maiden’s life was to be spared upon a toss of six or seven but she was to be forever banished from participation in community events and religious rites. And finally, if she rolled any number lower than six, the gods were to send her out into the sea to die. One cannot help but notice the fate of gamblers at the baccarat tables is decided on the basis of rather similar rules. Some historians would argue baccarat made its way to France when French soldiers returned home from the Franco-Italian war. Baccarat quickly excited the interest of King Charles VIII and became an instant success among the members of the French aristocracy. The game quickly travelled from France to England. 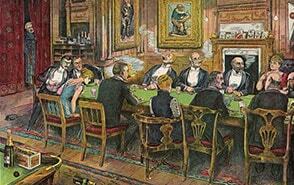 In these earlier versions, gamblers played against each other instead of playing against the house. As time passed by, baccarat crossed the ocean and made its way to South America. It was particularly popular in Cuba where it was given the name Punto Banco. The game’s rules also suffered some changes, the most important of which was that players were no longer allowed to assume the position of a bank and could play only against the house. In the mid 20th century, Fidel Castro started closing gambling establishments all over Havana in an attempt to destroy local mobsters. Former casino executive Tommy Renzoni then brought baccarat over to the casinos in Sin City. The game was first introduced in the Sands Casino but its success among the high-roller community caused it to quickly spread across other casinos on the Strip. After the introduction of online casinos in the mid-1990s, baccarat became available to gamblers from all walks of life. Today, when it is no longer reserved exclusively for the rich, baccarat enjoys an even greater popularity. Baccarat is a game of chance that is usually played with 8 full decks of cards. Similarly to blackjack, the cards in baccarat are also dealt out of a shoe. Depending on the variation, a baccarat table may support anywhere between 12 and 8 seats. The game is normally played in a secluded area that is separated from other tables. This area is usually referred to as the “baccarat pit”. The tables are often larger in size, similarly to those in the game of craps, so that they can support the higher number of participants. Baccarat is unique in that it involves an intricate shuffle ritual before the cards are actually inserted into the shoe to be dealt. The dealer would shuffle and cut the packs with a red plastic card somewhere towards the end of the shoe. This is to indicate at which point the reshuffle will take place. Only one more hand is to be dealt after the cut card is reached. When the decks are shuffled and cut, the dealer will put them into the shoe and will draw one card. The value of the drawn card (from 1 to 10) is to decide how many cards will be burned. Thus, if the drawn card has a value of 5, the dealer will burn five cards from the shoe. At some baccarat tables, dealers will not draw anything to determine the number of burned cards. Ten cards will be automatically burned in such cased. Baccarat bears a minuscule semblance to blackjack which typically also involves multiple decks and is dealt out of a shoe. However, the values of the cards in baccarat are rather different than those in blackjack. In baccarat, the face cards and the cards with pip value of 10 are counted as 0. Aces are assigned a value of 1. The value of all remaining cards (2 through 9) coincides with the number of pips on their front, i.e. a 2 is counted as 2, a 3 is counted as 3, and so on. Like in blackjack, the suits are irrelevant in the game of baccarat. The players take turns to make two main types of bets – the Player (Punto) and the Banker (Banco) but there is also the option to bet on a Tie. Bets on Player pay out even money, bets on Banker return at odds of 19:20 (due to the 5% house commission), and the Tie pays a very tasty 8:1, although 9/1 is now more normal at the best mobile casinos we work with. Some baccarat tables would list the payouts on winning Banker hands as 9 for 1. This should not be mistaken for a higher payout, because winners practically still receive 8 units in net profit in exchange for one unit the house gets to retain. It is possible to find tables where the Tie indeed returns at a rate of 9 to 1. After all players at the table have decided how much they want to bet, they place their chips in the respective boxes on the layout that read Player, Banker, and Tie. Baccarat dealers are not directly involved in the game, that is the Banker hand is not interpreted as the hand of the dealer. After bets are placed, the dealer would draw two cards for the Player hand and two for the Banker hand. The highest score possible is 9, the score being calculated by adding the cards’ values together. The values of any totals that surpass 9 are determined by discarding the first digit of the hand’s value. In simple terms, 5 and 6 for a total of 11 corresponds to a total of 1, whereas a 7 plus an 8 is worth 5. If the Player hand has a total smaller than 6 – they must hit and receive one additional card, whereas if the Player total is 6 and over, this hand must stand. If the Player stands – the Banker hand receives additional cards according to the same rules, i.e. if the Banker hand totals 5 and below, another card will be drawn. If the Player hand hits, then the action on the Banker’s hand depends on its exact score and what the third card in the Player hand is. As said, there is no skill in baccarat and that is because all moves other than the initial bet are totally dictated by the fixed rules of the game. On Banker totals of 0 to 2 – the Banker draws one more card no matter the value of the Player hand’s third card. On Banker totals of 3 – the Banker draws when the third card of the Player hand is 8. On Banker totals of 4 – the Banker draws when the third card of the Player hand is of value 0, 1, 8 or 9. On Banker totals of 5 – the Banker draws when the Player hand has been dealt a third card of 4, 5, 6, or 7. On Banker totals of 6 – the Banker draws upon the Player receiving 6 or 7 as the third card. The Banker hand must stand on all totals of 7 or above – no matter what the third card of the Player hand is Neither Banker, nor Player hands can bust. In truth, there is no need to know the exact Banker drawing rules on third cards, because at both online and landbased casinos, the dealer will automatically draw as required by the rules. In essence, this makes playing baccarat just about the easiest casino card game there is and this is part of its appeal, although some people consider the absence of decision making and skill a major disadvantage. To a degree, playing baccarat is a little like flipping a coin but despite this simplicity, the game remains hugely popular and part of this is due to its low house edge. As previously mentioned, winning Player hands are paid at even money, or 1:1 whereas winning Banker hands receive payouts at a ratio of 19:20. There is a 5% commission on winning Banker bets, though, so if you stake $100 on Banker and win, you will collect only $95 in net profit for a total of $195. The same stake returns $200 when made on a winning Player hand. Commission is paid because Banker hands have a bit higher win frequency than Player hands. It is estimated that one wins five hands more on Banker so the house enforces this commission to take away this advantage and even out the game. The house edge in baccarat depends on which hand you bet. If you back the Banker despite the standard 5% commission, you are looking at a house edge that compares very favourably to most casino games, especially considering that baccarat requires none of the basic strategy of blackjack. House Edge on Player Hand – back the Player and get paid out even money for a house edge of 1.24%. Banker Bets – back the Banker and your house edge, even with the effective payout of 19/20, drops to a very good 1.06%. Note that some baccarat tables may charge a reduced commission on Banker bets, in which case you will fight a house edge of 0.60% or 0.14% (depending on whether you pay 4% or 3% commission. The Tie – even at enhanced odds of 8 to 1 the Tie is a sucker bet, which gives the casino an appalling advantage of 14.36%. Occasionally, you may come across tables where the Tie returns 9 to 1 (not to be mistaken with the 9 for 1 payout) which causes the monstrous house edge on this bet to drop to the more bearable 4.84%. As well as the improved 9 to 1 payout on the tie, some casinos have been known, sometimes as promotions, to offer better odds (marginally – instead of evens they pay at 1.01 to 1) on the Player bet. These are certainly things to look out for if you decide baccarat is the mobile casino game for you. Banker/Player Pairs – some variations of baccarat support a side bet on a Player and Banker Pairs. You win a payout of 10 to 1 if either Player or Banker receives two cards of the same value, depending on which of the two sides you are backing. Before your mouth starts watering, we would like to warn you this proposition is also a no-go. Despite having a smaller advantage than the Tie, Player/Banker Pairs still give the house a two-digit edge of 10.36%. Baccarat and blackjack have yet another thing in common – the number of decks in play would have a direct effect on the house edge. The differences may appear minute but if you play regularly enough, they will have their say. The figures presented above correspond to an eight-deck baccarat variation. 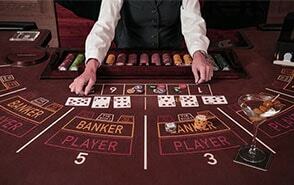 The house advantage for the Banker and Player bets in six-deck baccarat are the same. The only difference lies in the house edge for the Tie bet which increases slightly to 14.44%. Meanwhile, Player/Banker Pair bets would give the casino an edge of 11.25%. It is next to impossible to find a baccarat table where the game plays with a single deck only since most variations incorporate either 6 or 8 decks. But just for the purpose of comparison, check out the differences in the house edge for a single-deck baccarat game. Player bets yield the house an advantage of 1.01%. Banker bet gives the house an edge of 1.29%. Tie bets come with a higher house edge of 15.75%. The house edge for Player/Banker Pairs would make any person with a common sense cry since it escalates to 29.5%. 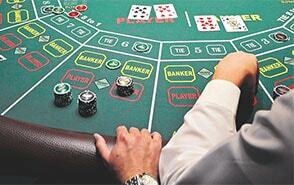 As you have probably noticed, baccarat is a game, based on chance. There is no decision making or skill since players cannot influence the outcomes of the coups in any way. The only thing one can control is the size of their bets. From this, it follows that the only way to minimize your losses would be to enforce good bankroll management at the baccarat tables. Bankroll management is a skill in itself, and one that needs to be nourished if you want to be a successful gambler. The first thing a baccarat player must do is set aside a bank, i.e. a sum of money they intend to use only for the purposes of playing the game. Then one needs to decide on a win goal and a loss limit. You leave the table as soon as you reach either your win goal or your loss limit. Author John Patrick recommends a win goal of 20% of your bankroll and a 50% loss limit for baccarat. According to Mr. Patrick, baccarat players should not take a seat at a table if their bank for the session is less than forty times the minimum bet. If you play online, you will be able to find baccarat tables where the minimum is set at $1. Respectively, you will need a bank of at least $40 for one such table. Apart from bankroll management, some baccarat players would follow the trends they observe at the table and place their bets accordingly. In our humble opinion though, the best way to go would be to stake your money on the side which offers you the lowest house edge, i.e. the Banker. Some seasoned baccarat players would even attempt to capitalize on trends and would continue placing Banker wagers until this proposition actually loses. Once a loss with the Banker bet occurs, such players would skip one coup and back the side that wins on the next one. Should a tie occur, you ignore it and wait for the outcome of the next coup. Last but not least, under no circumstances should you bet on the Tie. This is one of the worse propositions one could possibly back at a casino table along with some craps bets and the five-number bet in American roulette. Why? Because as explained earlier, the Tie gives the house an edge of 14.36% on eight-deck games which is to say you will lose $14.36 out of every $100 you wager. In comparison, players who back the Banker would incur average losses of $1.06 only per every $100 staked. So forget all about ties, always bet on the banker and keep your fingers crossed! 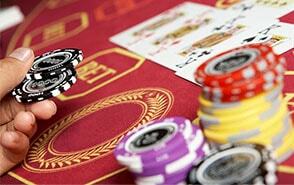 Unlike blackjack which is available in dozens of variations, the number of baccarat variations is quite limited. We would shed more light on two of the more interesting variants of the card game below. This variation of baccarat is offered by some gambling establishments in Europe, and more particularly those in France. The main goal here coincides with that in North American baccarat. Whichever hand gets a total closer to 9, wins. The card values are the same as those in the standard variation of the game. Chemin de Fer is closer to the original version of the game brought to France after the Franco-Italian war ended. The name of the game translates as “railroad” and this was inspired by the shoe’s counterclock rotation around the table that resembles the movements of a train. In Chemin de Fer, the casino does not assume the position of a banker. Instead, the role of banker changes between players with the rotation of the shoe or sabot, as they call it in French. At the start of the game, the position of banker is awarded to the player with the biggest bank, i.e. the person who has the highest amount of money. There is still a 5% commission on all winning Banker bets but the drawing rules differ from those in the variations played in North America. Here, instead of being forced to hit on totals of 5 or less, the Player has the option to either stand on their hand or draw more cards to improve its total. The Banker’s play is also optional. This game bears some semblance to baccarat but there are huge differences in some of the rules. It first emerged in Cambodia but now is also present in the catalogs of some live-dealer software providers like Evolution Gaming. The game can be played with any number of decks. The coup starts with the player choosing between Dragon and Tiger. The dealer then draws one card for each of these two sides. The player wins if the card of the side they are backing is of a higher rank than the card drawn for the other side. The game allows for a number of proposition bets including the suit of the card, whether the card will be big or small (small cards have a rank below 7) and suited ties. Both the Dragon/Tiger and the Tie bets have a higher house edge in this variation. Baccarat is the perfect option for novice casino players who are struggling to memorize the rules and more complex bet types in many of the other casino games. The Banker and Player are some of the bets with the lowest edge you can possibly find in a casino which makes baccarat particularly suitable for casual players. However, baccarat may not be the best option for gamblers who have grown accustomed to making decisions and influencing the outcome with skilful play.